Summer People ask us what life is like Around Here when they’re gone. Well, we say, it’s pretty normal. Louan called on Sunday–this would be last Sunday, not the Sunday we had yesterday. Did I want to go have a Polish dinner in Elk Rapids? Yes I did. 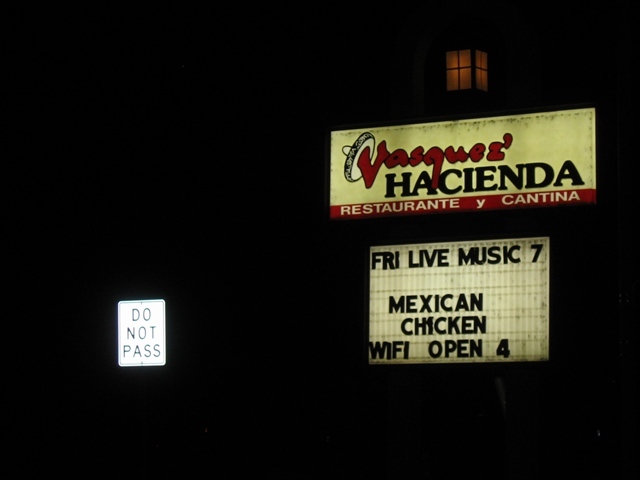 I drove down there and picked her up and when we got to the Hacienda it seemed only right to take a picture for TLV. Wait, wait! said Louan, climbing into the landscaping. I will be Vanna White! Then Lou-Vanna and I went in and found a booth near the fireplace and ordered the Polish Platter without even looking at the menu. You have to assume that if the Vasquez family takes it into their collective heads to feature Polish food there’s a good reason for it, and you just trust that it will all work out. 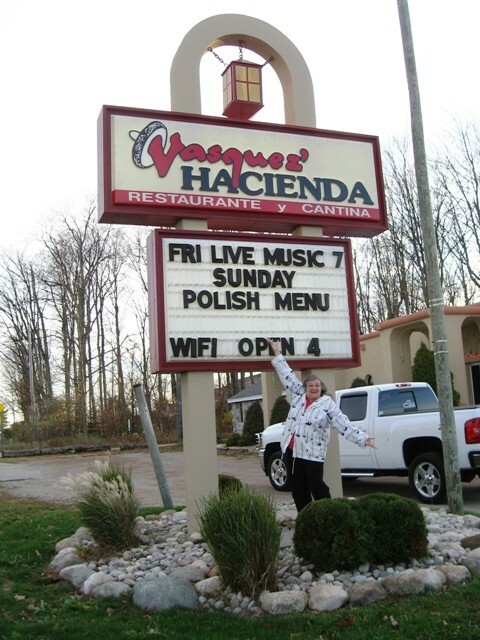 It was good to dig into kielbasa and pierogi and golumbki at the Hacienda in Elk Rapids. Louan and I had a good time swapping fish stories and eating. By the time we left it was dark out, and we (and the restaurant) went back to our regularly scheduled programming. I trundled homeward, deeply content, humming along to the radio, thinking what a fine day it had been. Just north of the roadside park I encountered a suicidal deer. Forty years in Michigan spotting the deer skulking in the shadows, getting ready to make their leap into eternity, and this is the first time I actually hit one. I said just what everyone says. I never saw it coming. I also said a few other things everyone says, but this is a family friendly blog so I will spare you those details. Fortunately Sgt. Wheatley of the Antrim County Sheriff’s office was behind me and to his wonder and amazement saw the whole thing happen right there in front of him. He let me babble until I ran down and then made sure the car was driveable and that I was able to drive it, which are of course two different things. We both passed muster, although both of us were a bit the worse for the encounter with the deer. The next morning I called my insurance agent and took pictures. You might not think so, but this is $3,400 [Update: $3,136.47] worth of damage. At least it is damage to the car, and not to my valuable person. 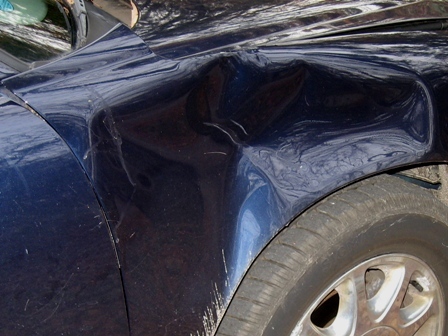 There is a lot to be said for car bodies designed to absorb the impact. Naturally I had a lot of explaining to do when Miss Sadie and the Cowboy discovered the evidence. 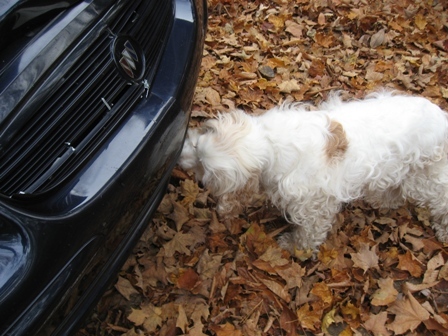 They conducted their own investigation, and paid particular attention to the bits of deer hair caught in the grill and to whatever was on the underside of the bumper, which I don’t care to think about. They agreed that it would be acceptable for me to continue to chauffeur them around, so that’s all right then. The last week has been a blur of consultations and small worries, which I am good at magnifying into insuperable obstacles in the middle of the night. The mysterious Insurance Claims Adjustor came and went. In due course – just a few minutes ago, actually – the Claims Department called. They will pay for the repairs rather than totalling the nine-year-old car. I’m glad of that. Betty Jo and I have discussed it, and we agree that we would really, really miss the heated seats just as the cold and clammy season descends. Now I’m going to go have another cup of coffee and contemplate which photo should be the Featured Image. Excellent treats or dismal destruction? Right. Treats it is. I’m glad you are okay, and my sentimental self mourns the deer. Hope the car pulls through in the end without too much time in the shop. Thank you. I expect it will take less than a week once the parts are in, and I can drive it meanwhile. I would mourn the deer except, well, I’m kind of mad at it. I might change my mind, but probably not this week. You have my sympathy on the deer front. Many years ago I was charged by a stag in the middle of the night while driving my sister’s car. It was a big animal and really made a mess of the front of the car. Luckily, the engine was in the back so I was able to drive home. Being me, I have to ask if you polished off your meal in good style? No reply necessary. Thank you. It’s a shock, isn’t it, hitting something like that. At least we are here to tell the tales to each other. Being me, I ate every bite of my tasty Polish dinner. I enjoyed it, too. (I had been helping my neighbor run heaps of fallen branches through the chipper, so I had worked up quite an appetite.) I’ve been on short rations ever since, but it was worth it. Glad that you are doing ok. It can be very unsettling to hit a deer. You are lucky Wheatly was behind you. Spending time along the road, just you and the deer waiting, is never fun. Hope this week goes better for you. P.S. Louan makes an excellent Vanna White…in fact I prefer Louan Vanna to the real one! I, um, did not stop immediately adjacent to where the deer flew through the air. I was looking for a better spot and found one. I figured if the deer was not, in fact, suicidal, but just absent-minded, it might be severely irritated with me. One deer encounter was enough for the evening. I am so glad the insurance company will pay to repair your car. I hope it is repaired quickly and correctly. I am glad you are okay too. Now on to your next adventure. Me too, me too! And the next adventure has already begun. So….what happened to the deer? I’ve always wondered if the meat can be salvaged by someone who knows what they’re doing or if a “sudden death” negates this opportunity? Something good to know so I’ll be prepared if I don’t have Sgt. Wheatley behind me when my turn comes up. It’s entirely possible to salvage venison in these situations; I believe Sgt. Wheatley would have been able to issue me a permit to keep the deer if I had wanted to, but the thought never crossed my mind. There are three or four guys of my acquaintance who are saying “Gahhh! Why didn’t you call me?! ?” We live and learn. Anyway, if you ever whack a deer, you need to pull over and call 911 to report the accident–unless Sgt. Wheatley happens to be on the scene again, in which case please say hello for me. Oh what a day, a meal and a shock encounter ! I am glad you are safe, Gerry. It must have been quite a shock ! Miss Sadie and the Cowboy look like the perfect investigators. Great pictures. Thank you, Isa. It was, they are, and we all hope that is the last adventure we have of that nature. I am so happy that you are all right. I still can’t believe any animal could make so much of an impact and that makes me feel so sad for the deer. I look at your car and read your words and think….when is my turn? We get comfortable on our drives home, drives in familiar territory. I’m always thinking about deer on the road, see them all the time in my headlights, off on the shoulders, wandering through the orchards, staring at me as I go by. I am glad you are physically fine and emotionally and mentally coping! Oh, gosh. 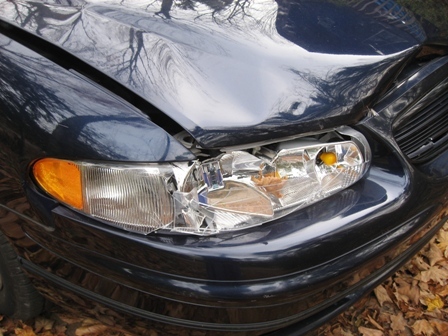 The deer are a huge worry this time of year, and they can do truly terrible damage to persons as well as cars. I’ve been told over and over again, if it’s going to happen, don’t swerve. Just hit the danged thing. Whether that’s good advice I don’t know, but since everyone says it with such confidence, and some of the people who say it are sixty year old guys who’ve run the country forever and run into deer now and then, I guess I’ll believe it. I am a firm believer in Do Not Swerve. It worked very well in this instance, as there was traffic coming in the other direction and traffic coming from behind me. It could have been very bad, but in the event, no one was harmed but the deer. I have stopped quivering and started feeling like it’s all going to turn out OK. I keep reminding myself that after all, I have power and there’s no mud in my living room. OK, just a little. The Cowboy really needs a bath and a haircut. Anyway, thank you for empathizing. Enjoy the pierogi. I’m glad you got home safely and in one piece. I read ‘A Parrot in the Pepper Tree’ recently, the author or which travels to Sweden each year to work as a sheep-shearer. He writes about the dangers of moose strikes, and how to avoid them. One way is to drive a Volvo, an advert for which showed a Japanese car full of very surprised Japanese and, standing before them, looming over the car, a vast bulk elk. The text read, ‘Buy Volvo – there are no elk in Japan.’ What kind of car were you driving? I didn’t recognise the marque because I don’t know much about American cars. That is a funny ad. Of course if I’d been driving a Volvo the exact same amount of body damage would have cost many thousands of dollars more to repair. Sigh. The navy blue sedan is a 2003 Buick Regal, made by General Motors. I bought it six years ago, if memory serves, from a friend who had hardly driven it. It would have been demolished by a full-size moose. On the other hand, inside its demolished body I would have stood a very good chance of surviving in the driver’s seat, always assuming I didn’t die of a heart attack before the volunteer fire department could take off the top of the car and remove my valuable person to safety. While the supper looked good the car does not. I almost (within inches) hit a deer on my way to work Thursday. Scary. But not unusual here, and probably even more not unusual there. I”m glad you’re OK…the car will get fixed….let the small stuff slide, and in the bigger scheme of things $3K+ is small I guess. Hope you’re breathing easier now. My closest call with a deer prior to this was in Oakland County. They’re everywhere. We are all feeling fine and frisky this morning. The insurance company will pay most of the repair bill and we should be done with the associated aggravation by Thanksgiving. Whew. So glad you had such a satisfying, delicious dinner before the deer changed your mood. You said the deer was “suicidal.” Is there venison steak in your future? We had about that amount of damage to an old van, and it looked just about like that, but the van was old enough that the insurance company of the woman who hit me at high speed in a parking lot (don’t ask–I have no answer) called our van totaled and just gave us the check. Not really connected to that story at all is all the money we’ve spent on my old truck since then, about twice the amount of the check for the van. Lose some, win some, lose some. Glad you were not hurt!!! It was good to have that moment of deep contentment. I did not retrieve the deer, and do not even know whether the meat could have been salvaged. There will be venison steak in my future just on general principles, but it won’t be from that particular deer. Thank you. I hope your truck is one of those that gets better with age and decides to go along for the long haul. So glad to hear that you are safe. Deer jumping out in front of you is certainly a scary experience. And I definitely believe that $3400 worth of damage. My poor car has had more than its share of visits with insurance adjusters (none of them my fault, mind you!) over the last few years, and I’m always stunned at the cost of the damage. In the Old Days a GM car would have been a tank, the repairs could have been done at any local garage in no time at all–and the driver would have ended up with whiplash or worse. It was a good tradeoff I think – more crushable car bodies absorbing the impact to protect our valuable persons. No easy solutions, but I am walking around amazed at how well the car protected me. Gotta like that in a car. I’ll try to remember that the next time something goes haywire in the complicated electrical system. Don’t get me started. Oh wait – that’s the car’s line . . .
You really were able to drive the car home?? That tire and fender look awfully close together. I heard on the radio that there 4,000 deer/car collisions per day in the USA. Quite a few deaths, mostly caused by swerving. I have had some very close calls and have learned to stop when one deer crosses the road because there probably is another following it. It’s no longer an out in the country thing. Ann Arbor now has a sizable deer population. An 8 point buck was strolling around in the back yard of our Ann Arbor place yesterday. Yes indeed, I drove home just fine, with the blessings of Sgt. Wheatley. The fender photo is misleading because of the angle of the shot; it’s well out of reach of the tire. Over 400 deer/vehicle crashes were reported in Antrim County in 2011 – and way more than that in most SE Michigan counties (simply because of greater traffic). I am astonished, though, to hear that you had a buck of that size in your back yard in Ann Arbor. The animals probably know something we don’t know. I think you are lucky to be in one piece Gerry. It sure wouldn’t have had the same outcome if it had been a moose. The nice thing about moose is that they don’t have a habit of leaping in front of the car. The bad thing about moose is that they have a habit of standing in the middle of the road meditating on life, indifferent to approaching vehicles. The scary thing about moose is that they are really, really big. Really. They’re big. If one is able, it is helpful to pray that you will not hurt a deer or any other living thing with the mass of machinery at your hand. If not, please drive more slowly so that cars and live things can merely glance off your vehicle somewhat safely. 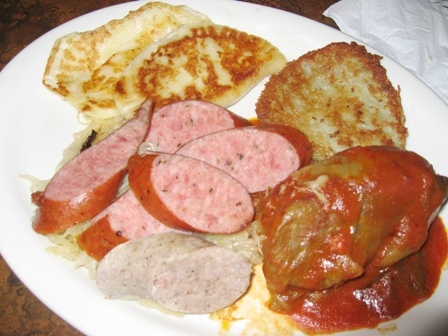 Since you have time in the southeast (Detroit) did you frequent the Polish Yacht Club? Oh, I had not read about your accident, I´m so glad to know you are fine. 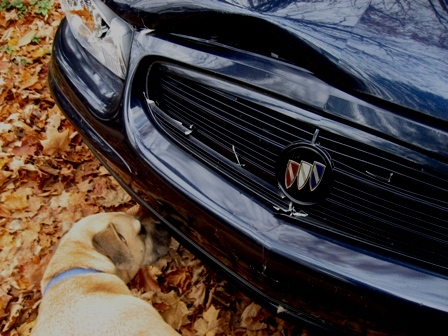 “53,592 vehicle-deer crashes in Michigan in 2011″…. – that is a shocking big number, are there any animals left? Perhaps being a little Dane living in a tiny country makes such numbers impossible to understand. We have of course the same problem. Changing from daylight saving time back to normal is a major factor that provoking accidents like this. The deers have learned when the roads are almost empty, but suddenly all the cars come one hour earlier/later. People are working at alarm systems, let´s hope they do it good. I´m glad to know you are all right. Thank you. I’m pleased to be in one piece. I thought that was a lot of vehicle-deer crashes, too, but I assure you we haven’t made much of a dent in the deer population.